Trout caught by Australian angler Cynthia Stevens. 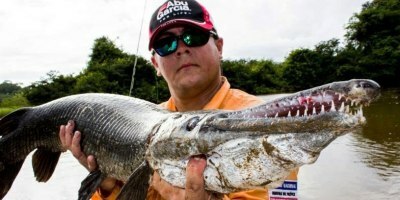 Fishing for trophies and records is a challenge for any angler, but this month’s IGFA Hot Catches update covers one of the most impressive achievements ever. In addition to potential world record carp caught in Japan and South Korea and a tropical gar caught in Costa Rica, the November IGFA report includes the announcement of the fastest Trout Royal Slam ever achieved – and done so by a woman who is legally blind. in the IGFA’s Hot Catches for November 2013. Australian angler Cynthia Stevens became the IGFA’s newest member of the Trout Royal Slam, which she completed in an incredible 15 days – the fastest ever – during a whirlwind trip through North America. Her quest began on Sept. 15 when she caught a brook trout in New Hampshire while fishing with Rick Holloran. Ten days later, and on the other side of the country, Cynthia caught her golden, rainbow, and brown while fishing the San Joaquin and Owens Rivers in California. After only two days of rest, Cynthia then traveled north to Oregon where she caught her lake, bull, and cutthroat over three consecutive days, while fishing Odell Lake, the Cougar Reservoir, and the Williamette River, respectively. Given Cynthia’s passion for angling, her extreme determination, and her goal-oriented personality, the IGFA’s Royal Slams were a perfect fit. And although Cynthia accomplished her slam in record time, it was anything but easy. Because all IGFA Slam & Trophy Clubs must be caught by IGFA rules, Cynthia made sure she was completely unassisted in all of her seven captures – something she had to reinforce with the helpful guides, all of whom provided testimony to the legitimacy of Cynthia’s captures.